At Dover Dental Associates, we are committed to enhancing the natural beauty of your smile by employing the latest in proven, conservative dental procedures. Dental crowns, which are a protective cap or cover for a damaged tooth, are one of the more common procedures we perform. A crown can not only protect the damaged tooth, but it can also improve its appearance and functionality. Traditionally, crowns are constructed in a dental laboratory and require at least two trips to the dentist to complete the procedure. However, Dover Dental Associates can speed up the process for patients in Dover, Sommersworth, and Rochester by utilizing CEREC® same-day crowns. 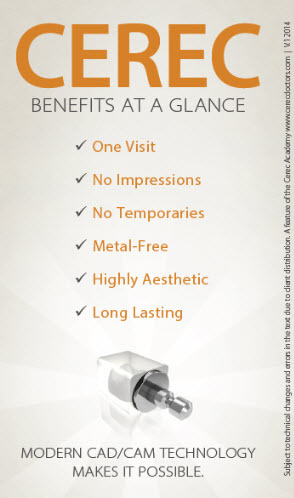 CEREC® (which stands for Chairside Economical Restoration of Esthetic Ceramics) allows our Dover dentists to create and insert ceramic crowns in a single appointment, rather than the multiple trips it normally takes for the crown implantation process. Traditional methods still serve a purpose in dentistry, particularly for metal-based restoration, but for most of our patients, the better convenience and effective quality of CEREC®-produced crowns are more beneficial than shipping a restoration to the laboratory. First, our Dover dentists will meet with you and conduct a full exam of your oral health. Once we have determined that a crown is the appropriate next step, we will explain the details of the CEREC process and see if you are a viable candidate for a same-day crown. If not, then we will provide the restoration you require by more traditional means. If so, we will start by applying a thin layer of a special reflective powder to the tooth’s surface. This enables us to capture an accurate digital photograph of the affected tooth, and that image will then be sent to the CEREC computer located in our Dover office. The CEREC system’s mapping program will use these digital photographs and 3-D imagery to custom mill your new crown out of dental porcelain. In a matter of minutes, you’ll be able to actually hold the finished product. A specialized bonding agent creates a firm hold to keep the crown permanently in place. The result is a newly restored tooth that looks, feels, and functions like a natural one. Contact Us for Crowns Today! The CEREC procedure is a convenient and efficient choice for dental crowns, and it has been in use for over three decades. At Dover Dental Associates, we strongly recommend this option for those who need a crown but do not want to wait the standard two weeks for a traditional process. If you are in Dover, Sommersworth, or Rochester and would like more information on CEREC® restorations, contact us today!